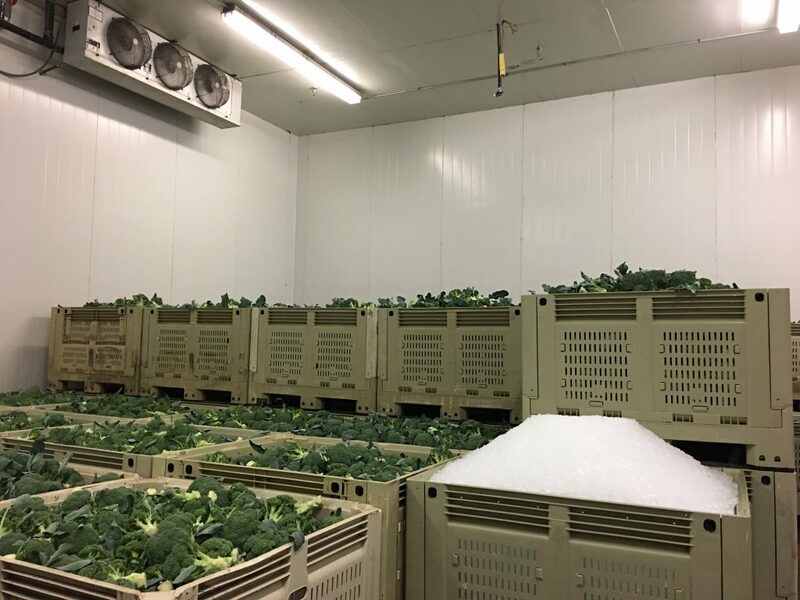 As part of their collaboration with the Eastern Broccoli Project, Produce Safety Alliance Director Betsy Bihn and University of Vermont Agricultural Engineer Chris Callahan have developed guidelines for the hygienic design of post-harvest equipment and surfaces in fresh vegetable packing operations. Prior to their efforts, this information was not readily available to growers and packers of fresh produce. Now Bihn and Callahan are teaming up with Cornell Cooperative Extension Specialist Robert Hadad to host a workshop on Farm Food Safety – Sanitary Design and Practice Considerations. The event will take place on March 27 from 9 am to 4:30 pm in Jordan Hall at Cornell AgriTech, 630 W North St., Geneva, NY 14456. The cost, including lunch, is $20 for Cornell Vegetable Program enrollees and $30 for non-enrollees. An online pre-registration form can be found at: https://cvp.cce.cornell.edu/event_preregistration.php?event=1084. Are you wondering what the implications of new food safety regulations are for broccoli production? Join Eastern Broccoli Food Safety specialists Chris Callahan, Betsy Bihn, and their colleagues on Monday, May 14 at 2 p.m. EDT for a webinar on “Produce Safety for Broccoli Producers”. Overview and feedback on educational material development. You can register for the webinar using the form below. Registration is not mandatory, but it will help us with planning and make it easier for you to get a direct link to the webinar via email. The form also has room for you to list specific questions that you would like to see addressed during the presentation. The webinar is geared towards growers, but the information will also be useful to buyers, extension specialists, researchers, and others. Registrants will be emailed instructions for joining the webinar by the day of the event. Powell Smith, a founding member of the Eastern Broccoli team, recently retired from his position as Horticultural Program Team Leader for Clemson Extension to spend more time outdoors beyond the vegetable field. An entomologist with experience in industry and academia, Powell brought insights about southeastern agriculture and the agricultural community to the Eastern Broccoli project and served as lead for project-related Yield trials and outreach in South Carolina. Those responsibilities now transfer fully to Brian Ward, who has been working with Powell since 2016. No word yet on whether Brian will continue Powell’s habit of sharing sunny South Carolina weather reports with snowbound colleagues up north. We thank Powell for all of his contributions to the Eastern Broccoli Project and wish him a long and joyful retirement. Happy kayaking, Powell! 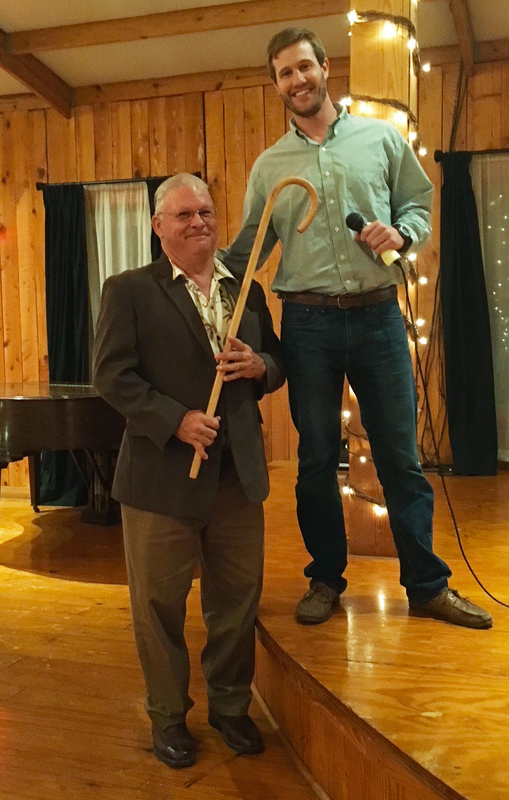 Powell Smith, left, with Extension agent Zack Snipes at Powell’s recent retirement party. Photo: Cory Tanner via Brian Ward. Photo 1. Broccoli plants in the second Hastings Quality trial planting, which was transplanted on 5 December 2015. The three center rows contain plots of broccoli hybrid entries, some of which have already produced crowns. Outer guard rows are planted to cauliflower. 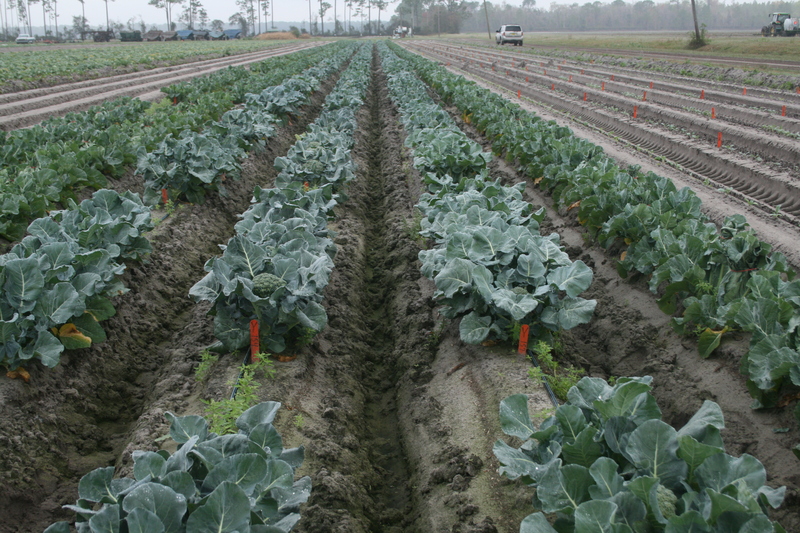 The Eastern Broccoli Project recently expanded its Quality trial network to include a site in the important winter growing region of northeastern Florida. 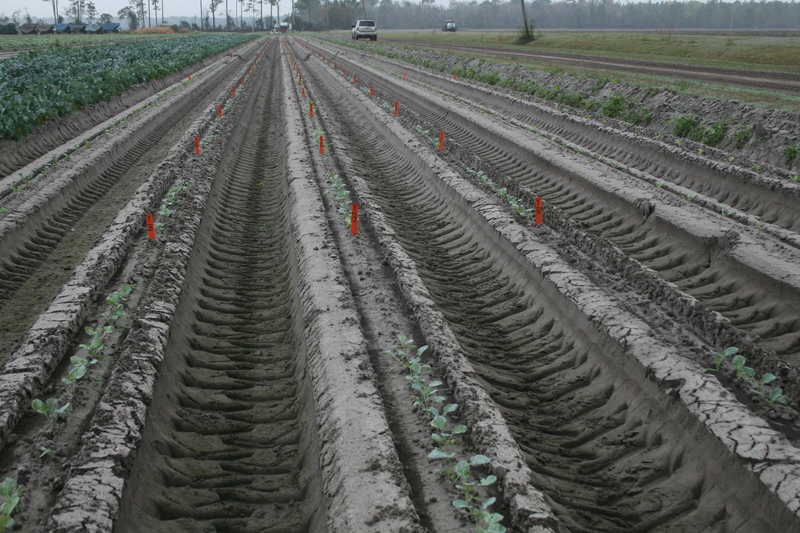 Lincoln Zotarelli oversees Quality trial plantings that run from October through April at the University of Florida’s Institute of Food and Agricultural Sciences (UF/IFAS) Hastings Agricultural Extension Center (HAEC). The Hastings location is differs from other Quality trial sites not only in the timing of its production season, but also in the way in which water is managed. The very sandy soils in this region are separated from the underlying aquifer by a clay hardpan that sits within a few feet of the soil surface. This arrangement allows seepage irrigation to deliver water to plants from below the soil surface through the precise management of water table levels. All other Eastern Broccoli Quality trial sites rely on drip or overhead water delivery. Florida Quality trial plantings this season were transplanted in early October 2017, early December 2017, and mid-February 2018. All three plantings included the same 31 broccoli hybrids that were rated at the four other Quality trial sites (in South Carolina, North Carolina, New York, and Maine) in 2017. Evaluations are complete for the first planting and in progress for the second planting (Photo 1, above). The third planting (Photo 2, at bottom) will undergo evaluation in early spring 2018. The Hastings trial has already drawn public attention. In November, a group of 30 Florida elected officials touring grower farms in the Tri-County Agricultural area stopped by the UF-HAEC and, as part of their visit, heard a presentation on the Eastern Broccoli project and the importance of the broccoli industry to the northeast Florida economy. In December, an overview of the broccoli project and its efforts to identify new cultivars adapted to Florida conditions was presented to and discussed with 34 attendees of the station’s 2017 Cole Crop field day. The Hastings site conducts the last set of plantings in the 14-month Eastern Broccoli Quality trial cycle that begins in February of the previous year. Already, the next Quality trial cycle has begun in Charleston, SC, where seed for a new set of trial entries was sown in February for transplant in mid-March. Photo 2. Recently transplanted third planting of 2017-2018 Hastings, FL Quality trial. Red stakes mark plots on raised beds with centers spaced 40 inches apart. Between-plant spacing within a plot is 8 inches. Plants will be ready for crown evaluations in early spring 2018. The US Vegetable Laboratory in Charleston, SC received a visit this past August from Secretary of Agriculture Sonny Perdue, who toured the facility and expressed his support for agricultural research, including the Eastern Broccoli Project. The clip below, from RFD-TV via YouTube, shows some highlights from the tour. Our colleague Mark Farnham, who heads the broccoli breeding program at the Lab, appears in several shots. Quality trial leader and Clemson CREC Research Scientist Brian Ward supplied the broccoli seedlings and rating charts shown at 1:31, and Ward can be seen discussing the project with Purdue at 2:02. 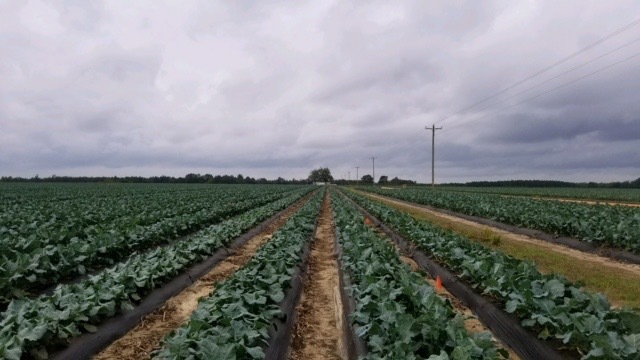 An Eastern Broccoli Yield trial in South Carolina will soon be ready to evaluate. Trial leaders Brian Ward and Powell Smith oversaw transplant of several broccoli cultivars on the farm of a commercial grower in Saluda County, SC. 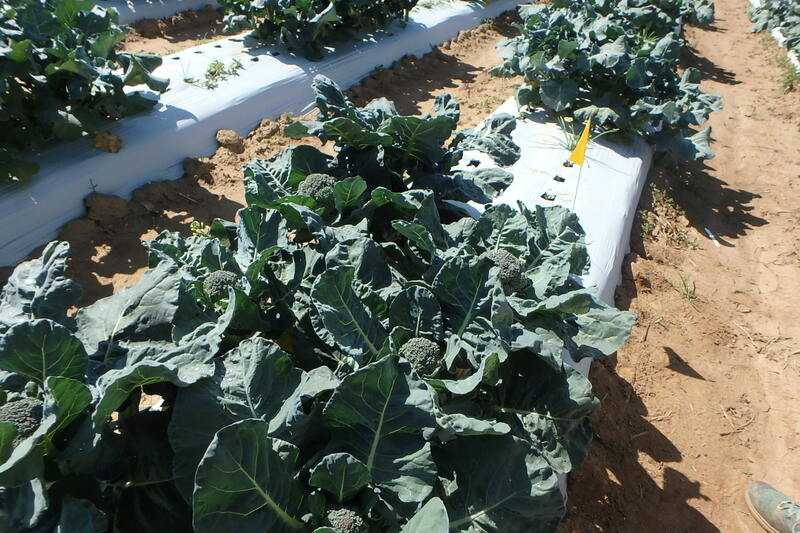 The broccoli was transplanted onto plastic-mulched raised beds on 5-foot centers with 10-inch in-row spacing and 12 inch between-row spacing. 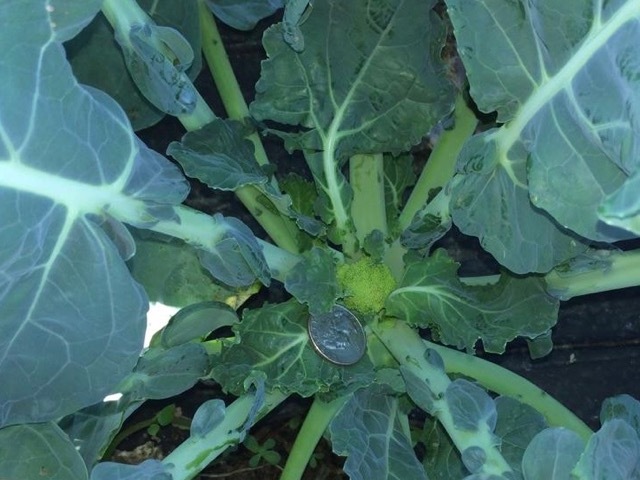 The photos below show small crowns forming in broccoli plants. Earlier in the season, the same beds and plastic were used to produce peppers; planting broccoli following another crop on plastic lets growers spread the cost of the mulch over more than one crop and is a common practice in the southeast. All three Eastern Broccoli Quality trial plantings in Maine are in the ground and have held up well in the face of changeable conditions this summer. The trial is running at Highmoor Farm in Monmouth, Maine. Transplant dates were June 16, June 27, and July 19. Rainfall is again an issue this year. From May 14 through August 16, the farm received only 4 inches of rain, about a third of the average amount. Fortunately, soil moisture was very high at the beginning of the season, and each planting has been drip-irrigated twice. Trial leader Mark Hutton reports that the quality of the trial is excellent. The Quality trial was open for observation during a late July field day at Highmoor Farm. Thirty vegetable growers viewed the plots. The group also included the director of a regional produce distributor interested in expanding the quantity of broccoli procured from small to medium size New England farms. Evaluations of broccoli in the first planting began on August 1. Many of the entries in that planting are now past maturity. Broccoli in the second planting should be ready for rating from late August through early September. 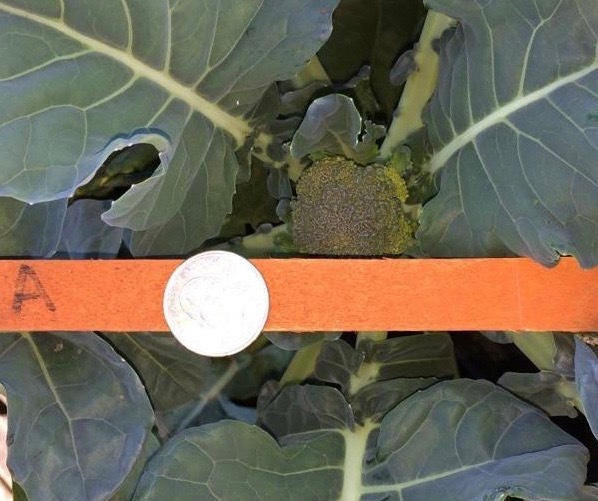 Broccoli in the third planting is expected to produce mature crowns by mid-September. Quality trial in Monmouth, Maine. Planting 1 is in the foreground. Photo taken in July 2017 by trial leader Mark Hutton. Broccoli crowns began appearing in North Carolina Eastern Broccoli Quality trial plots in late June. 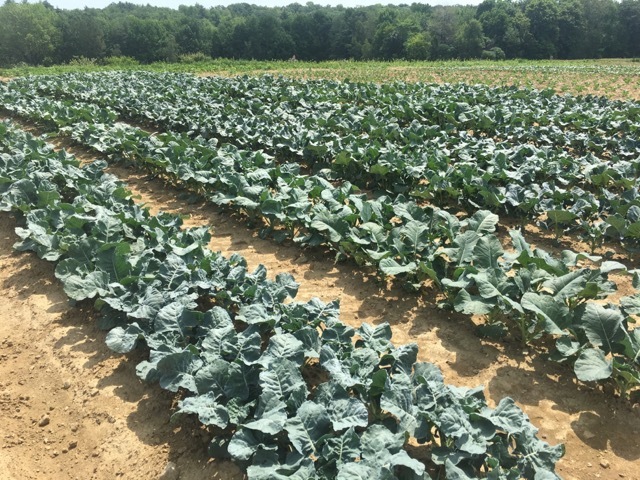 In mid-July, evaluations of hybrids in that planting were about 90 percent complete, while broccoli hybrids in the second planting (transplanted on June 12) were just beginning to show signs of heading. A third planting went in the ground on July 10. The season in Western NC started out hot, then turned cooler in late June. Summer heat and humidity returned in July. Some Alternaria and secondary fungal infections related to minor insect damage have been noted but managed. The limited amounts of seed available for new hybrids means that Quality trials plots are necessarily small. To achieve results that are representative of performance, plots of 15 plants per hybrid are replicated three times per planting, with three plantings per season happening at each Quality trial location. Broccoli in North Carolina Quality trials began forming crowns in late June. 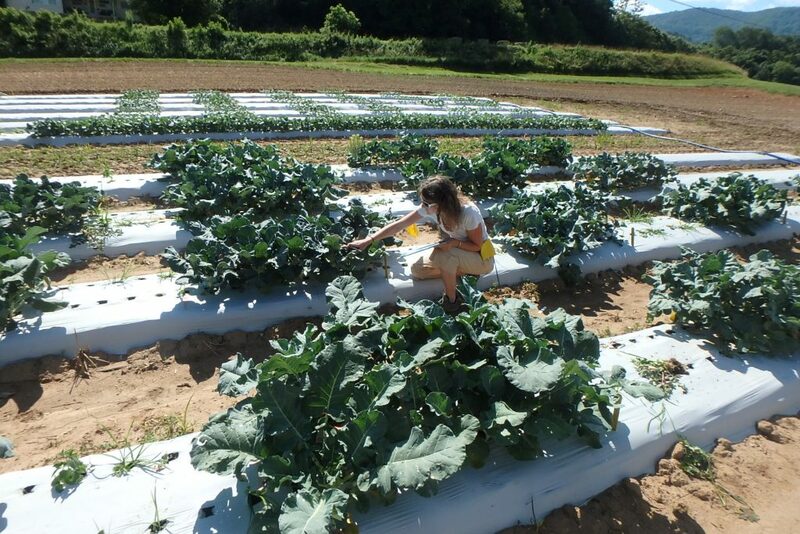 Margaret Bloomquist evaluates broccoli crowns in North Carolina Quality trials. 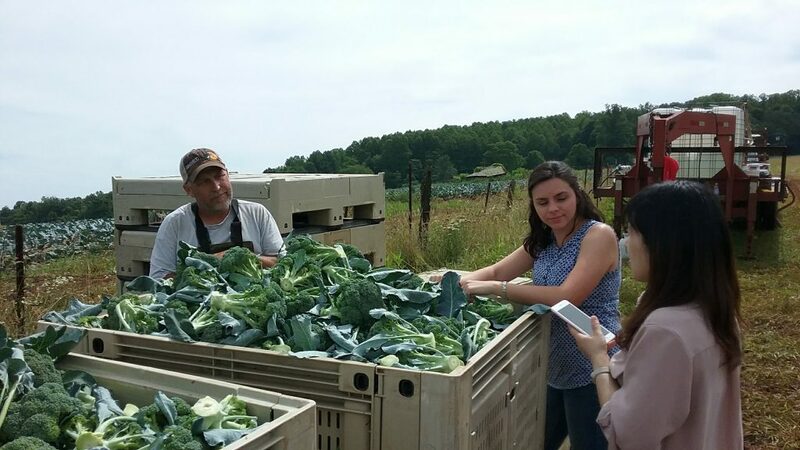 Carol Dong, Graduate Research Assistant with Miguel Gómez at Cornell University, recently visited broccoli growers and food hubs in southwest Virginia to collect information on local production and postharvest practices and costs. She was accompanied by Agricultural Consultant Wythe Morris, who helped put together the itinerary, and Virginia Tech Extension agent Ashley Edwards. Despite some challenges, the growers in Southwest Virginia are optimistic about broccoli and consider it an attractive crop. Dong learned about cultural practices and cost drivers in the region and will use the information to update crop budgets developed in 2012. Labor costs have increased, but that expense has been offset by a decrease in the cost of diesel. The overall cost of production is not expected to be significantly different than it was in 2012. At the Southwest Virginia Farmers Market and Appalachian Harvest, Dong observed various cooling technologies related to her work on cost efficiencies and supply chain optimization. Top icing and refrigeration are commonly used for cooling the broccoli in the region. Carol Dong (right) discusses broccoli production with grower Duane Cassell and Virginia Extension agent Ashley Edwards. Broccoli in cold storage room at the Southwest Virginia Farmers’ Market. The Eastern Broccoli blog and website are getting a fresh look! While the new appearance is already evident, updates to the content will take a bit longer. Key resources are still available on the site. Please let us know if you find broken links or are unable to locate specific pages. Would you like to receive notifications of new posts to the Eastern Broccoli Project Blog? Sign up below. It is spam free, opt out any time.